Canadian tennis star Eugenie Bouchard has honoured her promise to join a 20-year-old student for a date, after he won their Twitter wager over the US Super Bowl. While the Atlanta Falcons were 21-0 ahead, Ms Bouchard predicted their victory online. But when New England Patriots fan John Goehrke bet her a date that his team would triumph, she gamely accepted. The Patriots duly mounted a nail-biting comeback in the game’s dying minutes. 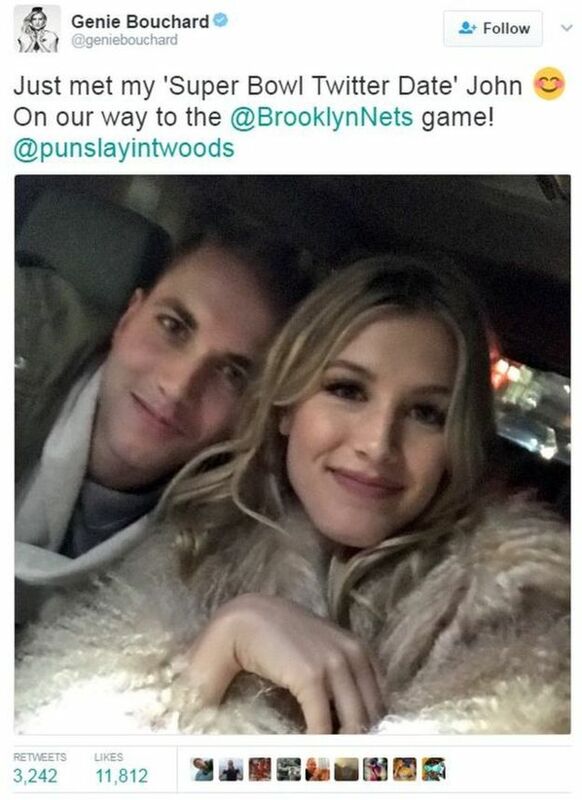 Ms Bouchard, 22, clearly a woman of her word, tweeted a picture of herself and Mr Goehrke en route to a New York basketball game. “Just met my ‘Super Bowl Twitter Date’ John. On our way to the @BrooklynNets game!” she wrote. The Montreal native had secured prime courtside seats for the encounter, where the Brooklyn Nets took on the Milwaukee Bucks. Ms Bouchard is a one-time Wimbledon finalist who is currently 44th in the world tennis rankings. She joked about her poor gambling form on the night of the Grammy’s, tweeting: “Not making any bets tonight!” with a laughing emoji. Quarterback Tom Brady, who led the Patriots to a 34-28 win, described the Super Bowl clash as a “hell of a football game”. Whether it sparked a historic love match too, fans will have to wait and see.